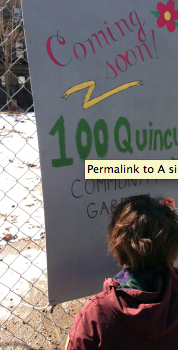 100 Quincy Community Garden is a vacant lot turned Community Garden that incorporates input from community members on design, event schedule, and how the garden should be used. The Garden is building a multi-bin composter to engage members, neighbors, and local businesses in composting. 2013 Winner of First-Ever Manhattan Community Scale Composting Contest.